Report: IRS Scrutiny Worse For Conservatives : It's All Politics A new House Ways and Means Committee staff analysis of groups applying for tax exempt status found conservative applicants faced, "more questions, more denials, more delays," says committee Chairman Dave Camp, R-Mich. 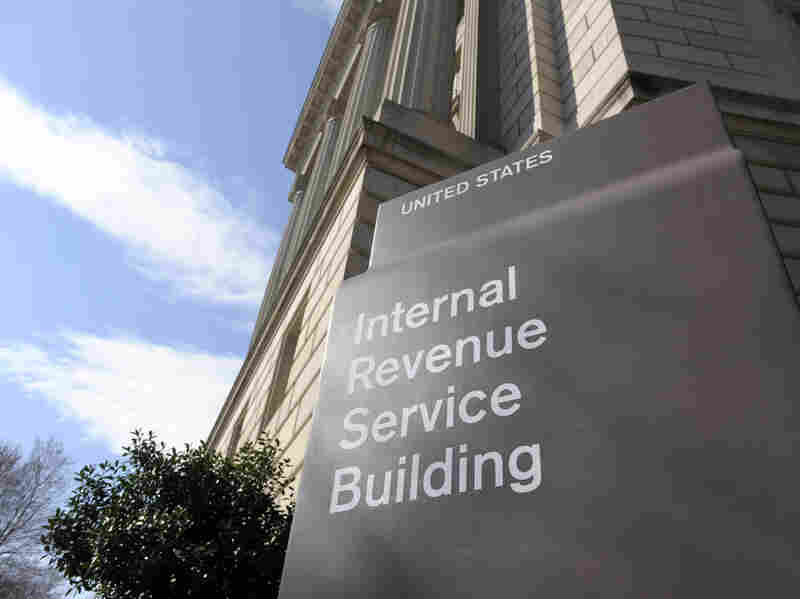 The Internal Revenue Service is accused of singling out conservative groups applying for tax-exempt status for extra scrutiny. House Republicans investigating IRS targeting of groups for extra scrutiny say they have proof conservatives had it worse. A House Ways and Means Committee staff analysis of the applications of 111 conservative and progressive groups applying for tax exempt status found conservative applicants faced "more questions, more denials, more delays," says committee Chairman Dave Camp, R-Mich.
That is, when the IRS sent groups letters asking for further information, conservative groups were asked more questions — on average, three times more. All of the groups with "progressive" in their name were ultimately approved, while only 46 percent of conservative groups won approval. Others are still waiting for an answer or gave up. 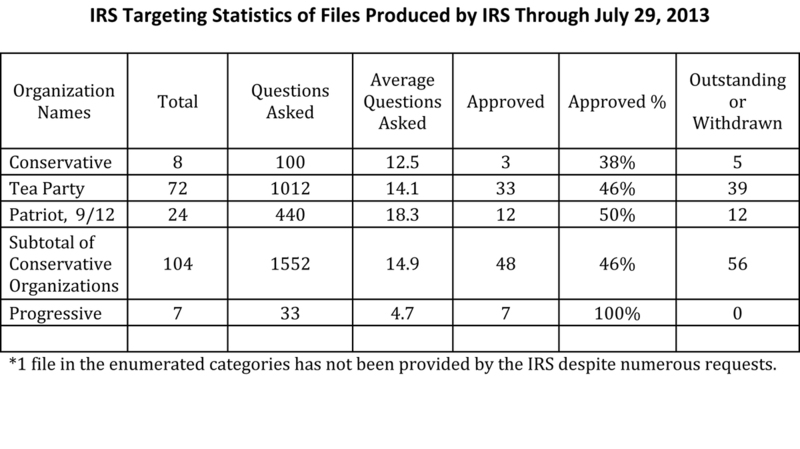 The majority staff dug into the applications of both conservative groups and progressive groups given extra scrutiny by the IRS, but for the purposes of the analysis looked only at groups with names that included terms the IRS used for flagging. The terms included "conservative," "Tea Party," "patriot 9/12" and "progressive." The committee opted not to make any judgments about the political leanings of other groups given extra scrutiny by the IRS, sticking only with those listed on IRS "Be on the Lookout" watch lists. The analysis is the closest so far to an objective numerical accounting of how the groups were treated by the IRS. Still, the top Democrat on the Ways and Means Committee insists the study is flawed. "The Republican analysis makes no mention of the time period of applications reviewed, no mention of whether they were the same applications reviewed by TIGTA [Treasury Inspector General for Tax Administration] in connection with the audit, and no mention of the fact that there are terms that reflect liberal organizations other than 'progressive.' What's more, it doesn't disclose the overall number of conservative groups — compared with liberal groups — who applied for tax-exempt status. This is a recurring problem in this investigation — the release of incomplete information. Indeed, that is exactly what led to fundamental flaws in the TIGTA report," Rep. Sander Levin, D-Mich., said in a statement. For Camp, the committee's chairman, these numbers validate ongoing Republican concerns that conservative groups were singled out. "Conservative groups were treated differently and were given more questions," he said in an interview with NPR. "[They] were denied their ability to get approved and had their applications delayed. That means that they were targeted." In other IRS news, House Oversight Committee Chairman Darrell Issa sent an angry letter to the acting head of the IRS saying the agency has systematically "attempted to delay, frustrate, impede, and obstruct the Committee's investigation." The letter asserted that the IRS identified some 64 million pages of documents, but has turned over only 12,000 pages so far. It points out that amounts to "a mere 0.019 percent" of what the committee is seeking, though it's not clear how anyone could read that many pages of emails and internal documents. But Issa is threatening to use the committee's subpoena powers if necessary. "If the IRS continues to hinder the Committee's investigation in any manner, the Committee will be forced to consider use of compulsory process," the letter concludes. All of which is to say, Congress may be going on a monthlong recess at the end of this week, but the IRS scandal isn't going anywhere, at least as far as House investigators are concerned.